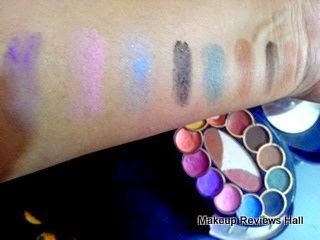 Today I am going to share with you my favorite makeup box, its usage and its eyeshadow swatches. 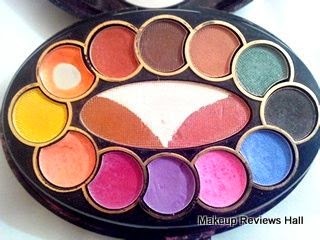 I have been using this since a long time that few of its eyeshadow are about to over and also a part of its section is broken after it slipped from my hands twice but I still have it with me. I have bought a Lancome Makeup Kit set recently but I still use this one more than that specially because of its amazing eye shadow shades which are available in almost all shades from light to dark. So here I am going to start with the swatches of the eyeshadow but before that just take a look at the box shape. This Civic Makeup Box looks cute in its oval curved look. It opens with the eyeshadow section, below follows the lip section and at the bottom comes the blushes for the cheek area. There are three brush holders at the bottom section which came with an eye shaow applicator and also a lip brush. 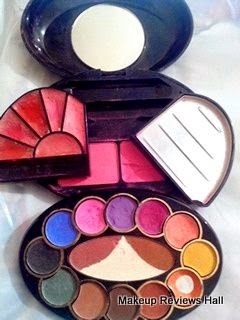 This Makeup Kit is very easy to use and can be carried easily because of its compact yet friendly design. The overall look of this is cute, stylish, manageable yet tarvel friendly and I always carry it with myself whenever I am out for few days, sometimes even when I am out for functions for a quick touch up. I just carry my Maybelline Colossal Kajal and Revlon New Complexion Foundation along with this box and I am all done. I normally use this makeup box mainly for two things for eyeshaow, since it has a lot of pretty shades to choose from to match with your dress and secondly I use the light baby pink blush on very frequently to give my cheeks a rosy glow. This box contains a total of 12 eye shadows including different shades of pink, purple, brown, green and many more. 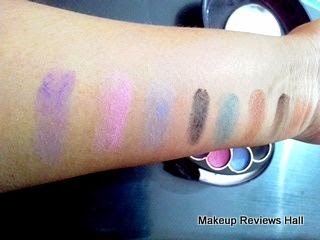 Take a look at the swatches below. I have tried all but some extremely light one are just not showing. I normally use the lightest peach colored shade for my daily use Its just perfect for small occasions and even for office and formal looks. For parties and functions I go for the dark shades green and black and sometime pink to match with the outfit. Whether I apply it light or dark, these get easily clean using Biotique Almond Oil Soothing Face Eye Makeup Cleanser. I hope you liked the swatches and review of my all time Fav Civic Makeup Box. I bought it long before but still keep using it at times because I love few of its eyeshadow so much that I just can't go without these stunning shades. I don't know if this box is still available or not but would definitely buy it again if it is.